Cut zucchini into very thin strips, to make zucchini noodles. Prepare pasta according to pack directions. While the pasta is cooking, slice cherry tomatoes into quarters, lightly stir the chunky basil dip and pluck fresh basil leaves off their stems. Once pasta is cooked, drain and reserve 2 x tablespoons of the “pasta water” Add pasta back into saucepan and add 1 x tablespoon of the reserved “pasta water”. Add the 2 x tablespoons of olive oil and toss through the spaghetti. (If you need it, at this stage, add remaining tablespoon of reserved “pasta water” so that the spaghetti is not sticky and remains glossy. Season with salt and pepper to taste. 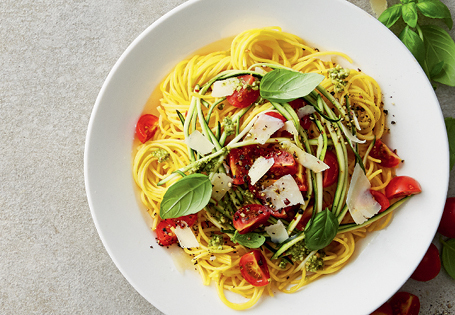 Immediately toss with zucchini noodles, half the amount of chunky basil dip and tomatoes. Serve warm spaghetti into each serving bowl. Add remaining basil dip and tomatoes. Top with sliced parmesan cheese and basil leaves. Drizzle with a little olive oil to taste. Serve with a lemon wedge. Serve immediately or refrigerate and serve later as a cold pasta dish.